Urn Tomb is sited at the base of Jebel Khubta (facing 270°N). 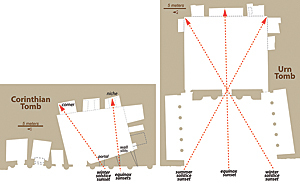 On the summer solstice and equinox sunsets, sunlight illuminates the far corner niches of the main chamber. The authors are associated with the King Fahd Center for Middle East Studies, an interdisciplinary program in the Fulbright College of Arts and Sciences at the University of Arkansas that is dedicated to the study of the modern Middle East. This article describes their work at the classical city of Petra, located in southern Jordan, which has been designated as a United Nations Educational, Scientific and Cultural Organization (UNESCO) World Heritage site. Steven Spielberg filmed the final scenes of the 1989 movie Indiana Jones and the Last Crusade in Petra, Jordan. Its fame has secured the so-called Rose Red City a place on tour itineraries and lists of must-see destinations. Since the film's release, the annual number of visitors to Petra has surged from 30,000 to nearly 1,000,000. Over the past 25 years, a team of researchers from the University of Arkansas has investigated the diverse landscapes of Petra. After initially examining the deterioration of sandstone architecture in the 1990s with UNESCO, the team expanded its work to include the effects of tourism on tomb humidity, reconstructions of catastrophic flooding, Bedouin urban morphology, and synoptic mapping of visitors in the valley. As part of a broader research plan, the team implemented a parkwide geoinformatics plan to bridge elements of geology, pedology, and climate with social sciences that included geography, archaeology, and urban studies along with tourist demographics and cultural heritage management and policy. When research in the early 1990s identified possible solar alignments in the Urn Tomb [one of the Royal Tombs in Petra] and the meticulously aligned east-west orientation of the hewn obelisks on Jebel Madhbah, it spawned new hypotheses and directions for research using complex analyses and implementing GIS. Structures and urban plans that were created to align with solar events and phenomena have become important markers of advanced society, theology, and engineering at prominent sites such as Stonehenge, Chaco Canyon, Abu Simbel, and Machu Picchu. Architecture was oriented so sunlight would fall on and/or enter these monuments on the sunrises or sunsets of the solstices and equinoxes. Evidence of sun worship has been found at sites and in sacred texts of cultures and societies for thousands of years. The sun is a theme that connects numerous global traditions. Ancient societies have built stone circles, megalithic temples, and buried vaults that aligned with the sun on the solstices and equinoxes. Some of the earliest communities and societies have identified earth-sun relationships as significant markers for the annual march of seasons and their related growing cycles. These celestial markers of the seasons evolved into days of worship and benchmarks for yearly events, holidays, and religious events. Over the past decade of research at Petra, it was determined that during the sunsets on the summer and winter solstices and autumnal and vernal equinoxes, sunlight entered the far reaches of the Urn Tomb chamber, precisely illuminating carved niches at the rear of the chamber. Either the Urn Tomb was hewn and oriented specifically to accommodate the penetrating sunrays, or the façade and portals were modified to permit this solar alignment. Horizon diagrams of the Corinthian and Urn Tombs, representing the marker solar paths. These two adjacent tombs have distinctly differing horizon markers during the summer solstice sunsets where the sun sets on the prominent horizon features of the towering plateau of Umm al-Biyara (Corinthian Tomb), and the famous burial site of Aaron, Moses' brother, on Jebel Haroun (Urn Tomb). In either case, this phenomena was not arbitrary. It was a calculated engineering feat that was accomplished 2,000 years ago. To understand earth-sun relationships that were used in Nabataean architectural orientation, it is vital to implement horizon diagramming with aspects of precession, nutation, and refraction, in conjunction with topographical and geographic data. 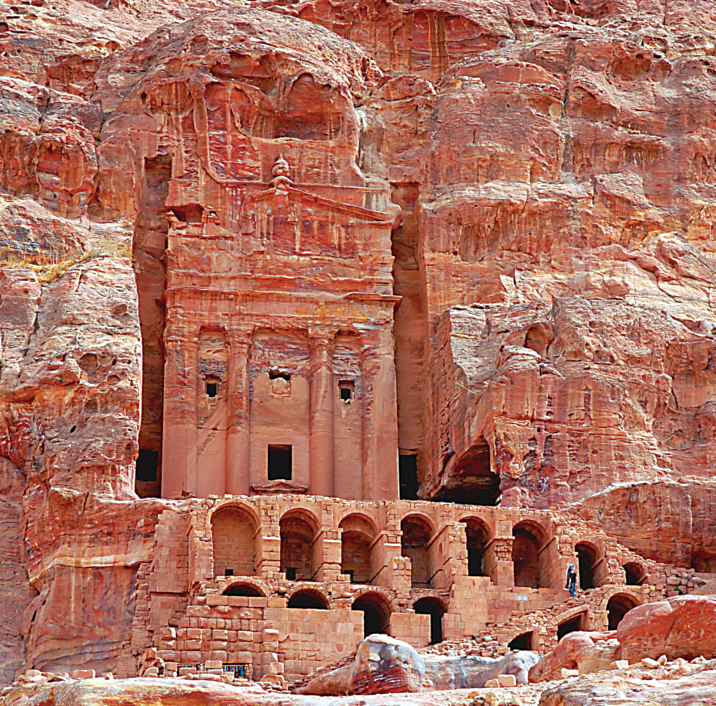 The incorporation of a GIS enabled this advanced analysis in Petra, and the findings were revolutionary. Investigating terrestrial and astronomical relationships using GIS presents a few challenges. The majority of GIS analyses are well suited for terrestrial, topographic, and distributive analysis along two- and three-dimensional landscapes. However, it is currently difficult to integrate astronomical data in a GIS, especially when calculating and representing historical astronomical events. One of the authors, Christopher Angel, the Arkansas project GIS coordinator, combined these analyses with astronomical data by merging the ArcGIS Python library (ArcPy) with the highly accurate PyEphem library, which adequately accounts for changes in precession, nutation, and refraction. [PyEphem provides basic astronomical computations for Python.] However, it is difficult to determine the validity of these relationships without geospatial visualization. Therefore, it was also necessary to reveal these relationships using the matplotlib library [which provides 2D plotting capabilities]. The order of processing was simplified by gathering the spatial attributes for each structure, analyzing potential terrestrial obstructions by generating a horizon diagram and overlaying celestial pathways for specific astronomical events within the specified time frame. Using ArcPy in conjunction with PyEphem and matplotlib, the team developed a script that uses vector point data to extract topographical data from a digital elevation model (DEM) in order to analyze celestial pathways in a horizon diagram. The key to this research was to identify the celestial pathways that cross Petra's skies, then and now. These tracks were generated by defining observer locations based on the spatial attributes (elevation, latitude, and longitude) for each point. In this case, PyEphem uses 1 January 50 BCE as a start date to identify each solstice and equinox. The returned date was used to determine the previous rising and the next setting times for that day. Within these time constraints, it was possible for the research team to emulate the passing of time by adding five minutes to the previous solar rising and return and both the azimuth and the altitude of the sun throughout that day. These values were then incorporated onto each horizon diagram that represented the astronomical event's rising and setting locations. An urban study such as this often considers the amount of energy investment required by a particular early society to construct an oriented structure within the greater urban landscape. 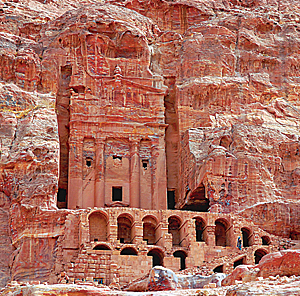 Considering the nature of the rock hewn structures across Petra, topography must have been paramount to the Nabataeans. Augmenting the physical landscape's natural properties to fit within a society's cultural preference requires considerable energy investment. Assessing this investment may divulge the importance of a structure's orientation over another. For the geographer, the energy requirements for shifting a terrain's natural slope and azimuth are quantified as costs. Identifying these costs allowed the team to reinforce the validity of a structure's intentional orientation and alignment. In addition to energy investment, analyzing the limiting costs of terrain (i.e., elevations, flood zones, man-made barriers, and structural visibility within the urban landscape) yielded further evidence concerning a structure's importance within the larger urban landscape. If a large amount of energy was required for a monumental structure, it can be assumed that the visibility and accessibility to the structure would be higher—a significant finding in this research. Petra's structural alignments were not arbitrary but part of a larger resource, urban, or cosmological plan. Plans of the Corinthian and Urn Tomb chambers illustrating the paths of incoming sunlight on solstices and equinoxes. The sunlight enters the Corinthian Tomb through distinctive wall slits and doorways in the tomb facade. While in the Urn Tomb, the sunlight enters through the central doorway. Not only do both tomb facades face prominent solstitial sunset points on the horizon but also display remarkable (and engineered) internal illumination on the same solstitial sunsets. In past research, the majority of alignment methodologies simply tabulate the rise/set azimuths alongside structural orientations in the form of a table. Although this is useful for statistical analyses, it abandons the geographic and topographical realities on the ground and their relationship to practical space and theoretical place. By representing this data using conventional geographic tools such as horizon diagrams and ArcGIS maps, not only can investigators identify and divulge possible relationships, but they can also identify topographical obstructions that might limit fields of view then (and now). Using innovative geomatics (GIS, cartography, remote sensing, and GPS) across Petra and the region, it is now easier to explore large datasets and inaccessible sites. The team at the University of Arkansas is currently adapting these tools and scripts to successfully analyze other types of astronomical/celestial data, such as lunar and astral relationships, in the hopes of revealing more relationships between celestial pathways, structural orientations, landscape, and large urban patterns. It was the use of GIS-generated horizon diagrams in this research that also enlightened the Arkansas team to other celestial relationships across Petra. Not only was solstitial and equinoctial illumination revealed in various tomb chambers and monuments but sunset and sunrise horizon landmarks were also identified. For example, it was found that on the summer solstice, the sun sets directly atop the highest point of the plateau of Umm al-Biyara when viewed from the Corinthian Tomb and atop the revered peak of Jebel Haroun (where Moses' brother Aaron is buried) from the Urn Tomb. These critical relationships were previously unknown in Nabataean research. The use of GIS, in conjunction with conventional horizon diagramming, revealed these architectural relationships in Petra. Prior alignment studies have been criticized as having been based solely on few, key locations across a particular area chosen specifically to support the hypothesis at hand. This study, however, utilized all of Petra's primary sites in the hopes of examining a broader foundation for Petra's urban form. In this study, however, the Arkansas team was able to comparatively and holistically investigate a multitude of structures in a single process to identify alignment relationships. This has enabled the team to make a stronger case for the intentional orientation and alignment of structures built in Nabataean Petra. These findings have proved invaluable when used in tandem with other spatial methodologies and datasets commonly integrated in the social sciences. Although these methods rely more on empirical analysis rather than the intentions of architects, authorities, and planners in these early societies, they enables the researchers to examine these complex questions that facilitate and encourage a deeper understanding of classical period urban morphologies. This may then link to social theories of early urban space, or even more profound discussions of cosmology and theology during Petra's heyday 2,000 years ago. The veneration of the sun can be found manifested in architecture across hundreds of years and thousands of miles. The sun—our source of life and light—is crucial to an ageless and ancient spirituality that is fundamental to architecture and urban planning, cosmology, and theology and a spiritual core that often guides and defines communities, societies, and culture. At the tomb-temple of Newgrange, Ireland (c. 3200BP), the large earthen mound is aligned with the rising sun so that the inner chamber is flooded with sunlight only on the winter solstice. At the hewn temples of Abu Simbel, Egypt (1244 Before Present [BP]), only the inner vault is illuminated on the shortest day of the year. At the Great Mayan Temple in Dzibilchaltún, Yucatán, Mexico, the rising sun illuminates and passes through its great portal only on the equinoxes. While at Stonehenge in the United Kingdom, it is the rising sun on the summer solstice that marks an important marker at the Heel Stone (and its missing partner stone). This veneration of the sun and an understanding of agricultural cycles may be the basis of many aspects of Petra's urban, structural, and monumental orientation and alignment, but it also may be the key that leads us to a better awareness of Petra's cosmology and spiritual essence and is made possible in part through the use of innovative GIS technologies. For more information, contact Tom Paradise or Chris Angel. Tom Paradise PhD, a professor of geosciences and Middle East studies at the University of Arkansas, specializes in stone architectural deterioration, geomorphology, cultural heritage management, and geospatial visualization and geomatics. He has worked in Petra since 1990, and his research and expertise have been sought by international agencies including the US State Department, UNESCO, and ICOMOS and a number of Mediterranean governments including Italy, Morocco, Tunisia, Egypt, Turkey, and Jordan. Chris Angel MA, a PhD candidate in environmental dynamics at the University of Arkansas, specializes in classical period and vernacular urban morphology, geomatics, and Middle East and North Africa geography. His research has included Bedouin town and village form, Roman and Nabataean city planning, and arid lands cultural and regional geography. He currently works in the Center for Advanced Spatial Technologies (CAST) at the University of Arkansas.